Cyclists in the City: Evening Standard: 'It is hoped pedestrians will hurry' out of the way of motor vehicles in London. The cyclists are going out again at Kings Cross on 23 January to protest. This time, it's not just about cycling. Evening Standard: 'It is hoped pedestrians will hurry' out of the way of motor vehicles in London. The cyclists are going out again at Kings Cross on 23 January to protest. This time, it's not just about cycling. At a recent residents' meeting I attended, the talk was about the new housing development around the corner - a development of several hundred apartments and terraced houses. "A proposal for a new pedestrian crossing was dropped by the developer after being persuaded by TfL that pedestrian demand was more than adequately met at two nearby junctions." 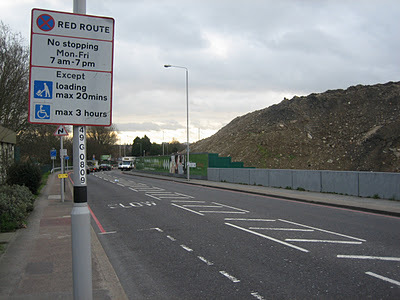 The road in question is Clapham Road - four lanes between Stockwell and Oval. Everyone at the meeting disagreed with TfL: there isn't a safe way to cross the road here unless you take a 400 metre detour via the traffic lights. Transport for London says the road lacks pedestrian demand. In the eyes of the people that live and work there, it is by no means clear how TfL measures 'demand'. Last week, I spotted something similar in Kidbrooke: Developers are building a new residential 'village'. According to the local blog KidbrookeKite, Kidbrooke Park Road will continue to be a 'formidable divide running through the centre of the community'. A crossing is a 'fundamental' requirement, say the developers. No, says Transport for London. That would compromise motor traffic. Once again - a new residential development, designed so that people who don't live there can get through the area by car. Not designed so that the people who do live there can walk to the shops. build any crossings for pedestrians on this road. The policy of removing or reducing pedestrian crossings has been going on since Boris Johnson took office. Back in 2009 the Evening Standard reported that pedestrian crossing times would be made shorter. Why? 'To cope with increased traffic when the Mayor abolishe[d] the western extension of the congestion zone'. We now know that motor traffic has increased 8% in the area since the congestion charge was removed. The Evening Standard headline at the time was: "Hurry up and cross..." Says it all really. Two years on, Boris's anti-pedestrian policy is growing. There are 58 pedestrian crossings for the chop in the next couple of months. They will be replaced with nothing - not a zebra crossing, just nothing. Let's take a few examples. Curtain Road in Hackney is losing its traffic lights. There is a new east-west cycle link along Rivington Street that crosses Curtain Road right here. You'll have to wait for a gap in the traffic and hop across. Older or infirm? Want to get from the shops on one side of Rivington Street to the other? Zebra crossing? No can do. Take a detour. At the top of London Bridge, another crossing is for the chop. Several more in Westminster, Richmond, Croydon, Barnet. You name it. This is all part of a deliberate policy by the Mayor to favour the motorist over everyone else in London. At any cost, it seems. The thing is, Londoners either haven't noticed or simply don't care. My reckoning is that Boris Johnson will still be Mayor in 2013. And I suspect most people think he's doing a good job. They think about how he is fighting off roadwork congestion, how he is removing congestion charge 'taxes', how he has battled Westminster council's parking charges. What they don't seem to have noticed is that comes with a cost. The cost is higher road casualties; more congestion as more people drive; the fact that it's more difficult and more dangerous to cross the road; the fact that pedestrian crossing times are being made shorter. As someone who cycles more than he drives, I'm particularly irked that cycling seems to be getting shunted out the way of schemes that favour motoring instead and that people are being refused the option not to drive. But my sense is that the Mayor thinks he's on the right course. Because he is pandering to a populist agenda - I want or need to drive, I want to do so cheaply and to park where and when I want. That agenda seems to be trumping alternatives. And when you look at other cities (New York, Paris, Berlin, Copenhagen), you'll see the exact opposite. Mayors in those cities are making it easier and cheaper to cycle or walk or take public transport. Our Mayor is making as easy and cheap to drive as his powers allow him. The alternatives are being shrunk not expanded. It's very strange that we are the only place busy going backwards. ﻿﻿﻿﻿When 2,500 people took to the streets to protest against exactly these sorts of policies at Blackfriars last year, the Mayor ignored them. Even when people are killed - for example at Bow roundabout - as a direct consequence of these road policies, the solution is to offer up something to the cyclists but nothing whatsoever for pedestrians. Two people were killed on their bikes at Bow in late 2011. Three people have been killed crossing the road near Bow in the last three years. What does the Mayor want? A half-hearted facility for cyclists. And nothing for the pedestrians. Why? They might get in the way of motor traffic. It seems to me that being polite and lobbying for change to these policies isn't working very fast. The letter-writing and the polite protests are shifting the debate a little bit. But Boris isn't really listening. His agenda is about making it easier for Londoners to drive around London. Not about reducing pollution or about offering Londoners cheaper and more convenient alternatives to the car, such as cycling. And I sense that the Mayor thinks road collisions are just one of those things that happen to people 'who don't have their wits about them' (to quote the Mayor talking about cycling London's most dangerous junctions). It is in that context that I am quietly encouraged by the presence of a new group called BikesAlive! The group - over 100 people on bikes - cycled slowly around the junctions at Kings Cross last week - scene of yet more pedestrian and cyclist carnage - to make the point that it is "time to rebalance priorities on London's roads in favour of people"
A report in the Guardian noted that the event was "potentially significant as a further sign that urban cyclists are taking a leaf from the book of their motorised cousins and lobbying furiously for better treatment.". What the Guardian didn't spot was the number of pedestrians also taking part. And it also failed to notice the very mainstream charitable organisations and lobbyist groups that were there on foot - watching, listening and learning about the Mayor's anti-people road agenda. BikesAlive is going out again on Monday 23rd. Once again, it will be making the point that the Mayor's policies are unbalancing London's streets, that the policies are not equitable. To some extent, that the Mayor's road policies are immoral. And this time, I sense the pedestrians will be there in greater numbers as well. And I imagine it won't be too long before some very big names start to join in with the protests. Old people, young children, disabled people can't just hurry across the road, the way the Mayor wants them to. And nor should they. I wasn't sure about BikesAlive last time it went out. I'm absolutely convinced now that it's doing the right thing. I will try to be there after work on 23 January, Kings Cross, 6pm. You can read more about it here. I think the Mayor thinks it's a populist agenda he's following - but he's dead wrong. I hear a lot of anger about these policies - and not from the usual suspects - but from people who'd usually support Boris. People don't like being prevented from driving for ideological reasons, it's true - but they still care about the young, the old, the disabled. Also, he's forgotten that everyone's a pedestrian at some point. When Boris talks about smoothing the traffic flow, and it means ensuring that roadworks are completed on time, he wins. When it becomes clear that he's making it impossible to walk and cycle safely around the city - when he's removing people's choices, and their freedom - and when it's clear that he's willing to sacrifice lives to prevent small delays to motor vehicles - he loses - and it may well be what ends up losing him the election. I cycle down Clapham Road every day, and there are ALWAYS pedestrians trying to cross the road, primarily as they are using the bus, which stops on the opposite side of the road to many residential streets. There is now a Tesco on the road too, increasing the number of people who want to cross the road at that point. Assuming I am referring to the correct part of the road (the rest of it is pretty well serviced by pedestrian crossings and a zebra crossing) it is ridiculous to suggest people should go to the junctions at either end. It would be a long walk, and nobody does this. Instead they take the risk of crossing four lanes. With the cycle superhighway, their crossing has been made even higher - as cyclists tend to follow the main wave of traffic and forms a continuous stream. I have to slow for people to cross daily - and it is dangerous for them. I don't think it would cause huge delays either as there is always a queue for the junction to the south. My guess is it would delay traffic from joining the next queue by about 15 seconds. Absurd. Yes, you are referring to the correct part of the road. As you say, TfL has allowed new shops and houses to be built but no way to cross the road to get to them. Hopefully with the coverage from the last one and given the numbers increased with each successive BF protest the turnout should hopefully make it a worthwhile effort and POSSIBLY make TFL and BoJo take notice. Of course one minor point I did see levelled at the last protest was that despite the cyclists and pedestrians slowing the traffic it wasn't much worse then "normal" ;-) Really makes you wonder why someone would sit stuck in traffic when they could actually be getting somewhere by bike or on foot much quicker! I made a periodic visit to London this weekend and was disturbed by the longer waits and shorter crossing times at the crossing lights I used. I noticed that ignoring them is becoming the norm: so even where they still exist more pedestrains are learning to cross without them. The certainty of serious accidents as vehicle speeds rise looks obvious. Even Sydney, Australia is doing a better job than London, and there is huge opposition there. There are so many places where you have to wait ages for crossings to change, there's the odd cyclist only ones that don't even give you a means of telling them you're there - that's one way to stop them changing... The thing is with a lot of lights that have been tampered to lengthen the wait and shorten the cross time is that they're not matched to neighbouring lights so you get gaps of nearly long enough to cross, then a wave of charging traffic races through (usually as the lights change) and that hits the "smoothed traffic flow"
I was in the city last night, and while I wasn't hurrying, crossing the Embankment by Blackfriars Bridge took me longer than the green man phase, and that was after quite a wait for the things to change, anyone less able would never make it.